Our retail sales specialists continually maintain all Advertisement and Out of Stock sheets. These information sheets contain current and future promotions and a maintenance list of items that are out of stock. This information is distributed to the appropriate Managers, Department Heads and Stock Personnel. Every distribution member has consistent information that enables proper product control and product positioning. Customarily, this information is updated weekly to personnel. Bay Food Brokerage maintains a focused interest in retail plan-o-gram development and have members in all major chain reset teams. This focus allows our staff to have control over placement of products. Product positioning is a major key in the success of an item at market level. These steps help ensure we have the best possible product positioning for the manufacturers that we represent. Consistent communication with the retail store helps ensure that all products are in the best location to allow for maximum retail growth. In addition to our constant communication we assist retail personnel in the development of product knowledge. This is essential in achieving and maintaining our manufacturers growth levels. New products require specialized handling. 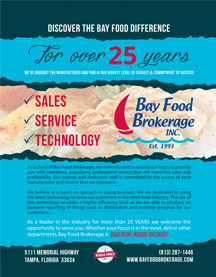 Bay Food Brokerage offers complete retail coverage with an action focus that guarantees the highest possible level stock distribution. Brand blocking is also an essential tool with all items of distribution. These forms of communication enable the manufacturers that we represent to have constant knowledge of whats happening with their products at store level. Bay Food Brokerage was selected by Publix Supermarkets to be an ISE Broker Representative for the Publix Team. We support not only our full manufacture partners on the ISE team but we are available to do ISE hours for other manufactures and brokers.